The Python For Loop is used to repeat a block of statements until there is no items in Object may be String, List, Tuple or any other object in python. For loop is one of the mostly used loop in any programming language. If you observe the above syntax, Object may be anything you want to iterate. For instance String or Python Lists so on. Next, it will execute the statements inside the For loop. Initialization: We initialize the variable(s) here. For example i=1. After completing the every iteration, compiler will traverse to next item. Again it will check for the new items in sequence. 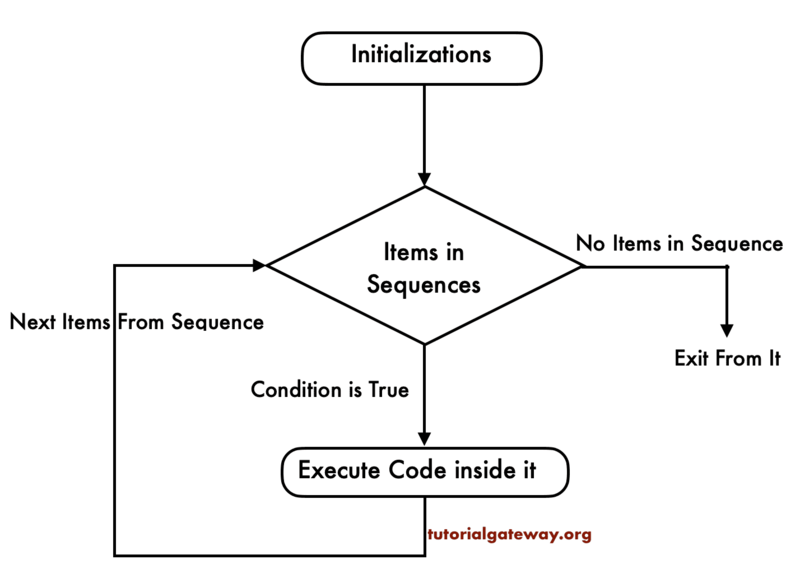 As long as the items in sequence, the statements inside the Python for loop will be executed. From the second Iteration, Country = ‘U K’. From the third Iteration, Country = ‘U S A’. From the fourth Iteration, Country = ‘Austraila’. Start: This is the optional argument and if you omit this argument then python range function will start looking from 0. End: The argument will notify the compiler about the range end position. Remember, if you specify 10 as end value then python range function will display up to 9. This Python range program will display the numbers from 0 to 4. Within the first for loop in python program, we started the range at 9. So, the first for loop is displaying values from 9 to 13. Where as, in the second for loop, we used the step value as 2 so, the second for loop is displaying alternative values from 5 to 18. This python for loop program will show you, How to use python range function on non integers. In the next line we used python range function. If you observe the below code, we used the len function inside the python range function to calculate the string length. The Python programming allows us to use the else statement with python For loop statements as well and it works like Python If Else statement. This python for loop else example program allows the user to enter an integer. If the user entered value is below 100 then compiler will execute the statements in for loop otherwise, print statement inside the else block will be executed.